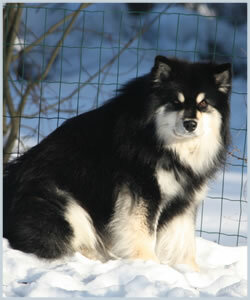 Back at the beginning of my Finnish Lapphund journey, I used to keep a fairly close eye on the breeding of Viksalan Kennels. I was particularly in love with their beautiful girl Viksalan Gimma, and was delighted to meet her in the flesh in 2007. Although it was the other beauty Viksalan Kulkurin Kukka, a half sister to my Emmi who just took my breath away! I could easily have stolen her! It wasn't much of a surprise that I paid particular attention to the breeding between Kulkarin Kukka and Gimma's litter brother, but life and other things distracted me, and it wasn't for several years that I came upon information on the handsome Konsta, whose dam was one of that combination. His sire is a pup who I had also been admiring while at Viksalan, so all up it was a pedigree I felt quite the heart beat for. Konsta is a very handsome, strong and masculine boy, and has had quite the successful show career. One of the things I like so much about him is his moderation in every way. 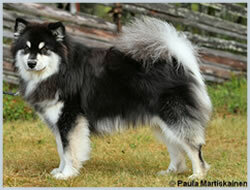 The Finnish Lapphund is a breed where exaggeration should never play a part, but, like with most breeds, it is always easy to see it creep in as certain attributes are sought. I'm told he is quite the character who loves both showing and obedience, but can cheekily "choose" just when to perform obedience with perfection or to create his own fun! 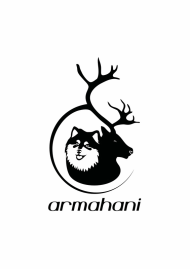 Thank you to owner Seija for allowing Konsta to be part of the Armahani future.